We report a case of mandibular radiation-induced osteosarcoma following radiotherapy for nasopharyngeal carcinoma with computed tomography (CT) and magnetic resonance imaging (MRI). A 62-year-old female presented with paralysis of the left side of the lower lip and swelling of the left side of the mandibular ramus within 3 months. On clinical examination, the tumor presented as a bony tissue mass in the left side of the mandibular ramus. Regarding the past medical records of the case, before 14 years, she presented with paralysis of the right side of the lower lip and tongue, and pain of the nasopharynx within 3 months. A biopsy of the nasopharynx was performed using fiberscope at another hospital, and the histopathological diagnosis was that of a squamous cell carcinoma. The tumor received radiation therapy of 60 Gy and was controlled after the radiation therapy. Regarding imaging, axial soft tissue algorithm CT showed extensive soft tissue infiltrative change extending to the masseter and medial pterygoid muscle [Figure 1]a. The bone tissue algorithm CT showed a mass lesion with sun ray appearance in the ramus of the left mandible [Figure 1]b. Coronal soft and bone tissue algorithm CT demonstrated to better advantage the mass lesion with sun ray appearance in the ramus of the left mandible [Figure 1]c and [Figure 1]d. On T1-weighted image (T1WI) the tumor showed a low signal intensity area; there was marginal enhancement on postcontrast T1WI [Figure 2]a and [Figure 2]b. T2-weighted image (T2WI) revealed heterogeneous, high signal intensity in the masticator space [Figure 2]c.
A biopsy was performed and histopathological examination of the biopsy specimen revealed irregular spindle or angular-shaped cells with atypia and mitoses, neoplastic osteoid matrix, chondroid matrix, and fibrous stroma [Figure 3]. Histopathological diagnosis was osteosarcoma. The risk of developing an osteosarcoma after radiotherapy is rated at around 0.01–0.03% of all irradiated patients. Moreover, radiation-induced osteosarcomas account for about 5.5% of all osteosarcomas. Primary osteogenic sarcomas originating from head and neck have been reported to constitute 1.6–2.7% of all cases of osteogenic sarcoma. Radiation-induced sarcomas in the head and neck are particular rare. Therefore, we reported a case of radiation-induced osteosarcoma of the mandibular ramus following radiotherapy for nasopharyngeal carcinoma with CT and MRI. The requirements for recognition of an osteosarcoma as being radiation-induced were laid down by Cahan in 1948 and later modified by Arlen in 1971: (1) The patient must have received a course of radiotherapy; (2) the tumor must arise within the area irradiated; (3) a suitably long interval must elapse between exposure to radiotherapy and tumor onset; (4) the tumor must be verified histologically; and (5) there must be no preexisting disease such as neurofibromatosis, retinoblastoma, or other. Franco et al. showed that the period of latency between initial radiation therapy and diagnosis of radiation-induced sarcoma of the head and neck ranged from 8 to 22 years. Cai et al. indicated that the median latency was 9 years (range 3–37 years) and the median radiation dose at the site of radiation-induced sarcomas was 66 Gy (range 44–78 Gy). Zhu et al. showed that the median latency period was 10 years and the accumulated radiation dose was 69 Gy. In our case, it appeared 14 years after radiation, and the tumor received radiation therapy of 60 Gy. When radiotherapy is performed for head and neck neoplasms, periodic follow-up observations may be necessary for many years. 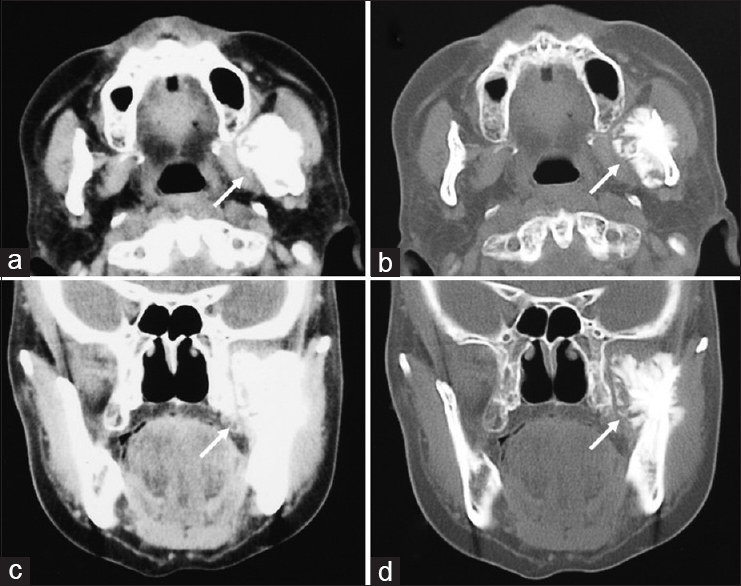 Regarding imaging of radiation-induced sarcoma of the head and neck, Alzahrani et al. indicated that CT showed a mixed iso- and hyperdense mass. Makimoto et al. indicated that imaging findings of CT and MRI were a heterogeneous and well-enhanced soft tissue mass and bone destruction. Cai et al. showed that heterogeneous density/signal intensity before and after enhancement was seen in all lesions on imaging. Thiagarajan et al. indicated that, in the head and neck region, MRI offers several well-recognized advantages over CT. In this study, the bone tissue algorithm CT showed a mass lesion with sun ray appearance in the ramus of the left mandible, and regarding MRI, on T1WI, the tumor showed a low signal intensity area; there was marginal enhancement on postcontrast T1WI. We consider that osteosarcoma tend to remodel bone, although elements of frank bone erosion also may be present, and osteosarcoma enhance well on contrast-enhanced MRI because of their rich vascular network. Therefore, we indicated that both CT and MRI are useful as imaging of radiation-induced sarcoma of the head and neck. The imaging findings are not diagnosis specific, however, strict follow-up within the radiation field by CT and MRI and an appreciation of the expected latency period may help to provide the diagnosis. In conclusion, radiation-induced osteosarcoma of the mandible is a potential sequel of radiation therapy. Although rare and might be confused with recurrent disease or osteoradionecrosis, this possibility should be considered in any patient who had received radiation therapy. This study described the CT and MRI of radiation-induced osteosarcoma of the mandibular ramus following radiotherapy for nasopharyngeal carcinoma. These findings can be helpful for differentiating osteosarcoma from other tumors of the mandible. We declare no financial support or relationship that may pose conflict of interest. Cai PQ, Wu YP, Li L, Zhang R, Xie CM, Wu PH, et al. CT and MRI of radiation-induced sarcomas of the head and neck following radiotherapy for nasopharyngeal carcinoma. Clin Radiol 2013;68:683-9. Thiagarajan A, Iyer NG. Radiation-induced sarcomas of the head and neck. World J Clin Oncol 2014;5:973-81. Alzahrani M, Robier A, Pointreau Y, Bakhos D. A rare case of radiation-induced osteosarcoma of the ethmoid sinus. Case Rep Otolaryngol 2011;2011:786202. Makimoto Y, Yamamoto S, Takano H, Motoori K, Ueda T, Kazama T, et al. Imaging findings of radiation-induced sarcoma of the head and neck. Br J Radiol 2007;80:790-7. Franco Gutierrez V, Llorente Pendas JL, Coca Pelaz A, Cabanillas Farpon R, Suarez Nieto C, et al. 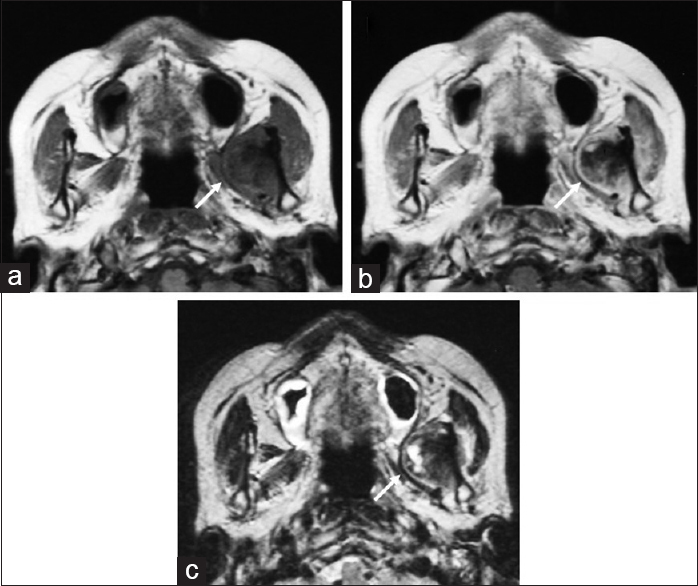 Radiation-induced sarcomas of the head and neck. J Craniofac Surg 2008;19:1287-91. Zhu W, Hu F, Zhao T, Wang C, Tao Q. Clinical characteristics of radiation-induced sarcoma of the head and neck: Review of 15 cases and 323 cases in the literature. J Oral Maxillofac Surg 2016;74:283-91. Cahan WG, Woodard HQ, Higinbotham NL, Stewart FW, Coley BL. Sarcoma arising in irradiated bone: Report of eleven cases. 1948. Cancer 1998;82:8-34.